Quite a unique experience. In the game you start off as “The Kid”. He wakes up and basically everyone and and everything has been destroyed/vanished. 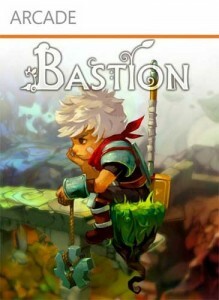 So “The Kid” needs to restore his world which is “Bastion”. At first glance you’re kind of like meh… You’re this kid with a hammer, arrows, and a whirlwind special move. Pretty basic stuff… But then the world starts coming alive as you walk through it. Literally the ground and the walls start to build themselves into this extremely cool world. One of the things that really drew me into this game however was the Narrator. With literally every move you make, every thing you destroy, and every thing you touch the bloody Narrator is talking about it! You fall off the ledge, “The Kid better watch his step…” You destroy something, “Didn’t take long for the Kid to become a pro at smashing stuff.” It really gives a new twist to gameplay like this. It’s classified as a RPG, but I’m not sure it really qualifies as one. Sure you make a few decisions, “Should I build this or that…” “Use this weapon or that weapon…” ect… It felt very straight forward. I was intrigued enough to finish the demo. However, with the price of 1,200 MSP ($15.00) I didn’t fill compelled enough to buy it. If it ever drops in price to 600 MSP again (Just missed it in the Countdown to New Years sell) I will definitely be picking it up. Download the demo, give it a shot. It’s quite unique. XBLA & PC Exclusive for now.